Yes, I still have the Jollibee commercial hangover LOL! We’re so used to hearing that last line from restaurant crews but do you know that it’s actually incorrect? So says this book, Don’t Speak Good. Speak Well! The “nosebleed” edition. Just so you know, the correct statement should be “For here or to go?” as take out is usually used as a noun, as in Chinese takeout. This is just among the many Filipinisms (non-standard English which we usually come up with by literally or loosely translating English words and expressions) discussed in the book. I’m learning a lot actually! While you can normally see 1 and 3 in regular grammar books, it’s so rare that you get ideas on how to start and keep a conversation going (part 2). It’s not a lengthy chapter but it does give a lot of pointers in sounding natural when conversing. 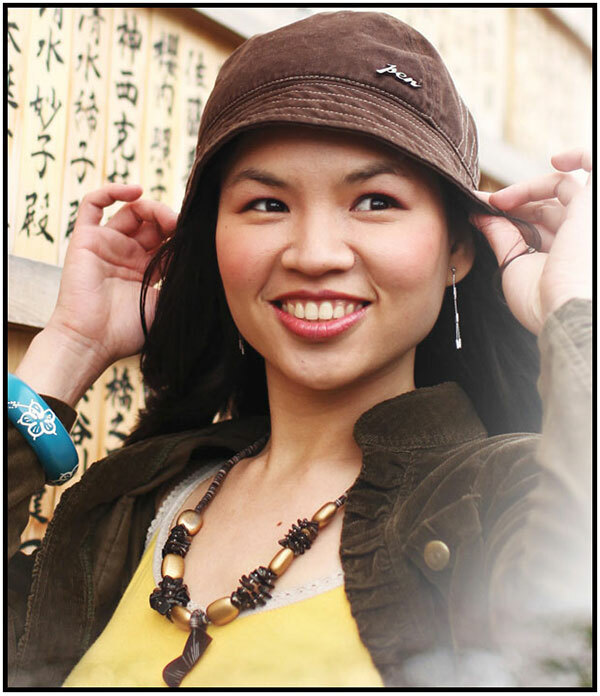 It also gives ideas on conversation starters, carrying on a conversation and even conversation enders! What a gem of a book, huh? At just 115 pages, it’s a very light read and a very handy helper for locals and foreigners alike. 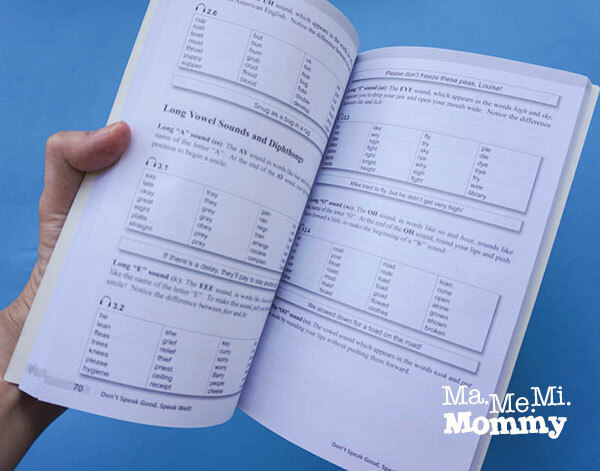 I’m actually in the process of teaching my son to read more English words and I’m finding the last part (the Sounds of English) very helpful. Each book has a unique product key that lets you enhance your learning beyond what’s written on the book. Because let’s face it, it’s so much easier to learn when you actually see and hear the words being said through videos and audios. 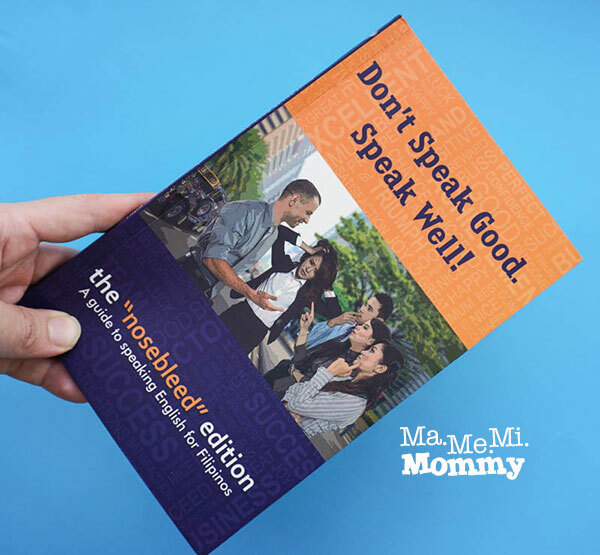 So if you’re looking to improve your English and don’t want the serious and traditional grammar books, I suggest you get your copy of Don’t Speak Good. Speak Well! It’s being offered at an introductory price of P590 and is available in bookstores nationwide. Catchy title, quite funny too. Grammar though is a real problem for most of us and this book sure looks helpful. looks interesting, I’ll check this at National Bookstore soon. I think this book will be helpful to us bloggers who attend events hehe 🙂 Glad that there’s an audio book din for proper pronunciation. Rowena Wendy Lei recently posted…Flossy x Hello Kitty Footwear now in the Philippines! In Fair! Nakakatuwa yung book!! This is going to be useful to my friends 🙂 Will recommend this read. I heard about this book some months ago and was meaning to buy it for myself.. i still haven’t got the time to visit the bookstore yet, i am so forgetful too.. hahaha! Maybe i should get this tomorrow asap! We were just Puerto Princesa last month but we went straight to El Nido. Next time we’ll allot more time in the city.. So far, I only hear “dine in or take out” in PH talaga. When I was in Oman and other Gulf countries, it’s always “for here or to go”. 🙂 This is a nice book. I do teach English to individuals from time to time and this will be a great reference. I am honestly not good in spoken English. I’d rather write than speak the language but it really is important that we know proper grammar and usage of English words. This book will be one of those good to have and keep at home especially when you’re raising kids and you’d want them to ‘speak the language well’. I have to get a copy of this book… it is an interesting read. Love this book as well. It is very concise and easy to read. I found my 11 year old reading this book one morning while waiting for his school service. He told me after a week that he learned new things from the book. This will be so helpful to many Filipinos. A lot of us think that our English is good not knowing that we are saying so many things incorrectly. I always get a weird look every time I say, “to go.” I tend to be a grammar nazi, but what I hate most is someone who talks nonsense. Love the subtitle “Nosebleed edition”- I almost spit my coffee…lol. Some of my friends told me that language is subjective and in some cases I agree to this. We hear the ‘dine-in or take-out’ phrase all the time but hey- what’s important we understand exactly what it means and that is the very essence of effective communications. Language is a tool and can differ from place to place. Reading becomes more pleasurable when you gain new knowledge or insights. I miss reading books like this. I wish someone would do something like to for Filipino language naman. Would love to read this as I always appreciate an easy read while learning. It will be a very source for English speaking learners but I agree with Fully Housewifed, I think more and more families these days need tutorials in speaking better Filipino.